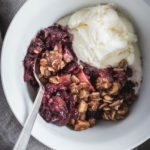 Oregon blackberries and Honeycrisp apples are combined and topped with a hazelnut oat topping creating the perfect combination of flavors for this healthier version of a fruit crisp dessert. A perfect dessert for anytime of the year and any type of gathering. In a bowl, mix together the topping ingredients. In a 9×13″ baking pan combine the chopped apples and frozen blackberries. Add the topping in a layer over the blackberries and apples. Bake for 45 minutes or until the fruit is bubbling and the topping is beautifully crisp and golden. Eat…and maybe serve with ice cream or heavy whipping cream which totally negates the healthier part of this recipe but it does provide a really great excuse to splurge! ?